I truly believe in getting up every day and working as hard as you can to better yourself, your family, and the others that are the closest to you. I enjoy pushing myself to limits that I should fail at but have the will to push to see myself succeed. I also have a passion of pushing others to the point as that I am usually be being hated before I am being liked. I love helping people and will do anything possible to help that person in need. I broke into the construction industry at an early age with my father, Sheldon, being a finish trim carpenter/drywall finisher. My uncle, David, being an electrician. Other uncle, Steve, owning excavation equipment and business. Other uncle, Sandy, and grandfather, Sterling, was well known in the Murfreesboro community as a home builder and general contractor. Growing up at an early age I found myself after school and during the summer working as an apprentice on jobsites. In my teenage years, I became a framing helper on my uncle’s jobsites. After I graduated from high school and tried other random jobs but always found myself coming back to the construction industry. In my early 20’s I went to work for another uncle as an electrician where I enjoyed working on commercial jobs with family. After a few short years I found myself re-united with a high school friend, Jason, where I was given the opportunity to come on board to learn how to install replacement windows and siding. I am lucky enough to say that I am still working for Jason and greatly honored for him to let me push him and the company to higher limits. I am proud to say that Superior Renovation Group, LLC has grown 20 times the size as it was when I first started. It took a few years of seeing other builders pop up homes in the Nashville market until I could get Jason motivated and pushed into thinking that this could be us also. 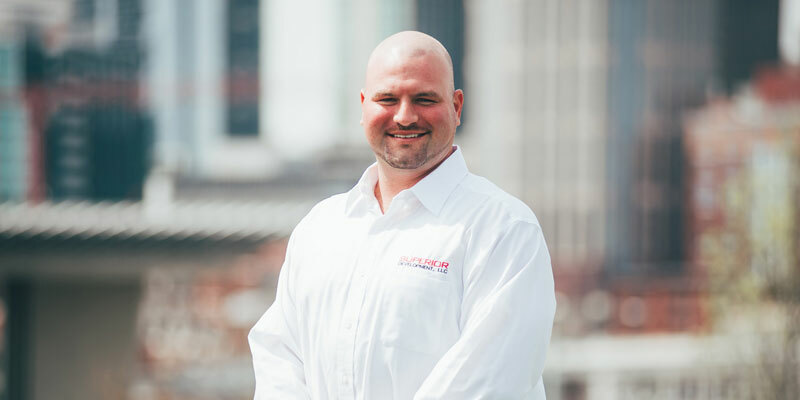 I took over the reins to SRG, LLC in 2014 so Jason could focus on becoming a general contractor. In a short period of time I was also given the opportunity to come work for Superior Development, LLC also.